A bunch of rusty American cars riddled with bullet holes are sitting in the hills behind Salt Lake City. Most of them are from the 50s and others are from the 60s. They were likely stolen and pushed down to where they are but I have no idea how they would have gotten them up there. It's different from the others in at least one way: I don't think this one is American, it's much too small. I'm leaning towards British. I don't think it's Italian. I thought it might be a Datsun but it's not that either. Whatever it is, it's not an MG. It has front drum brakes, presumably rear ones as well but the entire axle is gone. It's rear wheel drive but that doesn't narrow it down much. Since the other cars are from the 50s and 60s I have reason to believe that his one is too. The only hint is the sheetmetal surrounding the headlight and turn signal: it's flat so that rules out a lot of curved front cars. The Cité des Sciences in Paris is hosting a 2CV exhibit to honor the car's 60th anniversay. Honestly the exhibit itself, which lasts until November, is disappointing, save for two cars, there isn't anything you won't see at a car show. The two cars, however, are very worth seeing, and worth putting up with the herds of screaming German and English 12 year olds. One is a 1939 2CV. If you're familiar with 2CVs, you're probably thinking "hey, the 2CV only came out in 1948!" It was originally planned for release much earlier. This is actually one of the prototypes for the 2CV. At the time it was dubbed the TPV, for "Très Petite Voiture" (Very Small Car.) A number of these were built between 1937 and 1939, including 250 pre-series models built just weeks before WWII. The Citroën factory was bombed when France was invaded in WWII and for fear that they would wind up in the Germans' hands, the prototypes were either destroyed, dismantled and/or hidden in various places. Engineers secretly worked on the 2CV during the war using whatever materials they could get their hands on. Even with that, the production version of it wouldn't be ready until 1948. A lot of design cues were carried over from the prototype-- the headlights mounted on the fenders, the flat 2 setup, the long, sloping hood and the canvas top, just to name a few. One of the prototypes was later used by Michelin to test tires and retired in 1946. Then, in 1997, 2CV enthusiasts gasped as the news was announced: three more had just been discovered in an attic. Two of those were restored and one was left original. The car pictured here is one of them. This one has a flat 2-cylinder but unlike regular production 2CVs it's water cooled. The rear brakes are cable operated, the windshield wiper is manual and it was good for about 60km/h. The second car I want to mention is a 1961 2CV Sahara. Citroën wanted to make a four wheel drive version of the car but, not wanting to get involved with transfer cases and the like, they saw another way to do it: they installed a second drivetrain in the rear of the car to drive the rear wheels. It was the exact same as the one in the front, just facing backwards. The spare was relocated the top of the hood. The car now had two gas tanks and they were relocated to under the front seats, with the filler hose popping out of either front door. Few were ever sold and these are a rare sight today. I saw this Renault Estafette while on a bike ride around here. These were once a common sight in France, used by a lot of businesses to carry well.. just about anything. Then they became a common sight in fields like this one but today they're getting scarce just about everywhere. Before I go any further, I should mention that I don't particularly dislike the new Delta. No, my problem is with the Fiat/Lancia marketing department. That is a Lancia Delta S4. This and the Delta Integrale largely dominated the rallye scene of the 1980s. Before that, Lancia had the Stratos which dominated the 1970s rallye scene. Lancia is a great name in rallye and the Delta, launched in 1979, was a great torchbearer for that reputation. But, this wasn't the previous Delta. The Nuova Delta was a completely botched attempt at making a luxury hatch. The sport aspect of the car was abandoned in lieu of a more upscale model. That cancelled out the old Delta's customer base. But, the new model didn't have a redeeming quality to draw new customers. It limped on until it was phased out in 1999, a rather pathetic way to end the Delta's 20 year career. 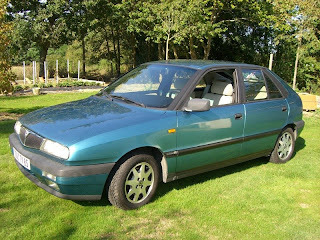 - Lancia Musa, based on a car that has its own issues, the Fiat Idea. Think Renault Modus, that sort of car. - Lancia Phedra, based on a Fiat Ulysse, an all too expensive minivan that is rarely seen on the road. - Lancia Ypsilon, based on a Fiat Punto, this little car is only available as a three door hatch and is very popular in Italy but mostly forgotten about elsewhere. Most of them are sold with an odd two tone paint to add to the luxurious feeling of the car. - Lancia Thesis. Lancia's flagship sedan, reminiscent of the old Flaminias. This is actually a great car. Generously equipped, it handles well and in my opinion (though not that of the general public) a great looking car. Even with its qualities, it doesn't appeal to anybody aside from important government figures in Italy. If memory serves me right, forty seven of these were sold in 2007 here in France, it can't compete against Mercedes Es and BMW 5s. 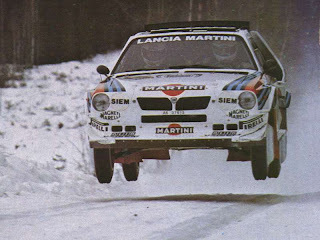 To make it short: Lancia was going downhill, fast. Rumors of its demise started circulating around the press. Then came another rumor, a more hopeful one: just as Fiat was preparing a new 500, Lancia was preparing a new Delta. An opportunity to bring back one of the most fondly remembered names in rallye, generate sales, potentially enter the rallye scene once again and if they played their cards right save their name and company. What's this one based off of? Well, if you've ever sat in a Fiat Bravo, you'll recognize it right off the bat because they haven't bothered to do much to change the dash. Instead of bringing back an icon, Lancia has done it again and tried to upmarket a Fiat. They've tried to turn the Delta into a luxury car again. Well equipped but rather expensive (starts at €21,000 or so), it's slightly odd shape makes it too small to be a compact car but too big to be a midsize car, two very popular segments here in Europe, and more importantly two segments that Lancia is all but present in. Some of the drivetrains are pulled directly from Fiat's lineup while others are specific to the Lancia brand. Like with most new cars, it's available with one airbag per bone in the human body and all sorts of high tech doo das. The sport past of the Delta isn't emphasized anywhere in this car, its only relation with the past is its name. No rallye future is planned for this one. "Delta is a historical name associated with a peak in Lancia’s motoring past but it is also a mathematical symbol that stands for change, difference and evolution. From this viewpoint, the Lancia Delta is the first product of the new Lancia philosophy. It has an original, unique positioning, the combination of two values that are fundamental for the brand, elegant styling and a daring, innovative attitude, that inspires all aspects of its marketing and communications activities." But, was it the right thing to do? Can this car really save Lancia like it's supposed to? As a Lancia owner and enthusiast, I hate to say it but I don't think so. They had the opportunity to create a great small car and blew it completly. This Delta is the kind of crossover car a company launches when it can afford to make a market blunder, not when it's on life support, trying to bring back customers left and right in just about every market, horizontally and vertically. Yes, that's right. It's a Citroen Dyane. It's also traveling on Interstate 80 in central Pennsylvania of all places and I matched speeds with it at about 75 miles per hour. Furthermore, it was actually passing other vehicles on the highway. All facts which seem very strange when put together. You'll also notice on close inspection of this photograph that the car is leaning to the right. It would appear, judging by the "GB" sticker and plates that it was imported from the UK and the rather robust driver is sitting on the right hand side. All in all, a very odd find indeed. In the United States, it seems as if the Honda Civic is enjoying as much of a presence on our streets and highways as the (old) Volkswagen Beetle did in the 1960s and 70s. The latest generation of Civic especially. It's interesting how both cars are/were affordable, well built, efficient, and rather odd looking and really caught on in a time when fuel prices were rising rapidly.Be that as it may, the most recent Honda Civic Si is hardly comparable to the Volkswagen Super-Beetle "Sport" of the early 1970s which had nothing more than blacked out chrome accents and a different steering wheel. Honda took what is basically a sensible, economic, family sedan and put 197hp engine in it, a lot of 'racy' interior materials, added 17 inch wheels... then tuned the whole chassis at Mid-Ohio Sports Car Course. The first thing you notice about the Civic Si, like all of the latest generation of Civics, is how odd it is to sit behind the wheel of one. The bottom of the windshield disappears below the horizon of the dashboard like the sky over the vast plains of the mid-west. There seems to be acres of dashboard which is only broken up by some clever sculpting and the two-tier instrument panel. When looking at it from the outside, it all seems rather absurd. But when you sit down in the stiff, heavily bolstered sport seats, it all falls right into your line of sight perfectly. The steering wheel, as well as the red-accented instruments - which are a combination of digital and analog - is quite reminiscent of a video-game. Perhaps a bit over done. Fire up the 2.0 litre DOHC VTEC four cylinder and the Si's tasteful sport exhaust reminds you that this Civic is more about excitement that economics. (I emphasize 'tasteful' so as not to give the impression that it comes from the factory with a "fart-can" exhaust) Mated to a six-speed manual gearbox that is about as slick as the industry produces, and you have one hell of a drive-train under the hood. Under acceleration, this engine effortlessly revs and the VTEC system doesn't even switch cam profiles till about 6000 rpm. But when it does, you certainly notice it. There's a distinct change in sound and you can feel the extra pull as if winds out even further to 8,200 rpm. The rev-limiter kicks in at 8,300. All of this is good for 197 hp. The catch however, is a lack of torque - a problem which has always plagued Honda engines. That's not to say it's severely bad though. The car is, after all a 2-litre, which even when not driven hard, gives it a distinct power gain over lesser Civics and certainly over those from the past. I found it took a little getting used, but not much. Mostly it just involves a bit more use of the gearbox. The clutch has near perfect weight to it and the brakes are also excellent. Steering is very responsive, though the electric power steering (a feature only on the Si) is a tad artificial feeling at parking-lot speeds. If I may use the video-game analogy again, it's like a force-feedback gaming wheel. The transmission - well, it should be studied by all car companies for its smoothness and precision. The chassis and suspension are quite stiff and road surface imperfections are definitely noticeable, The low-profile tires on 17 inch alloys no doubt add to this as well, though it's still a fine cruising car on the highway. This car does handle damn well. It's very responsive and confidence inspiring with barely any body roll. And after all, let's keep in mind this is a fairly good sized sedan compared to something such as a Mini Cooper. One area which will have to wait to be tested is of course how it can handle winter driving. It's pretty much certain that a set of extra wheels and tires will have to be swapped on when the snow begins to fall. The low-profile Michelins just aren't going to make it in North-West Pennsylvania. s really stepped it up a notch. Say what you will about the interior styling, but the quality and the materials are first rate. Now having said that, is it like a contemporary Volkswagen? No. There are some hard plastic bits here and there and the occasional big gap in some pieces, but one probably won't have to worry about the glove box door of the Honda falling off without a fair fight. paint is free of orange-peel. It may not seem like that should even be considered on a modern car, but take a good look at a new Chevy Cobalt or something like that. As for the styling, well it personally reminds me of something Citroen of Renault would make. It's an odd package, but it works very well. Despite what seems like a very small trunk lid, it's luggage capacity is quite cavernous and dare I say, even rivals my old Saab 900s. Though with this particular car, it's a bit early to comment on how well it's holding together, I must say that having grown up around Hondas I can attest to their superb quality at an affordable price. Forgive me if I sound like a Honda spokesman, but I really do think they build a damn good product. If this Honda is anything like the my dad's daily driver '88, '92, and '96 Civics were, then it should be just fine. Whether you like it or not, or feel like it's a car for frat-boys in their early 20s, the Civic Si really is a hell of a good package. It's great fun to drive (especially for a $22,000 sedan) yet still very practical (especially in 4-door form) and, if driven sensibly, very economical. I'm first and foremost a European car enthusiast, but this is a damn respectable offering of a Canadian built car from a Japanese company.